Well, at least that's the judgement of Jerry Mahlman, then head of the NOAA Geophysical Fluid Dynamics Lab. How about Alan Hecht, deputy assistant administrator in the EPA office of intemational activities,who has"real problems" with the study. Hecht passed detailed comments onto the EPA administrator. Al Gore was concerned. Richard Lindzen loved it. The President's chief of Staff was said to be "holding the report up like a cross to a vampire, fending off greenhouse warming." Nierenberg was know to personally brief OMB, Council of Economic Advisors and other high officials about the report and was looking for more to speak with. OK got your attention, but this is NOT the 1983 National Academy of Sciences report of which Stoat is all over the case as is Atmoz, but a 1989 report by the three horsemen of the Marshall Institute, Jastrow, Nierenberg, and Seitz, "Scientific Perspectives on the Greenhouse Problem". You can find it at Amazon for $0.41 There is another "Global Warming, What does the Science Tell Us"? There is lots of information about the furor surrounding both on the net, but AFAEK not the originals. Recently, this blog, and others went to the mattresses about the idea that the greenhouse effect acts like a blanket. As you may recall Atmoz had previously used an actual blanket and concluded that blankets cut off convection and conduction, but don't have much effect on radiation. Eli pointed out that survival blankets do cut off radiation, but several people thought that they also cut off convection. For those of you who don't know, a survival blanket is a thin piece of plasticized metal foil that you wrap around yourself when the heat goes out on the space station, or your return capsule lands in Siberia. If you go to Eli's link you will see an example. So Eli started thinking and came up with the following. Take a lightbulb and wrap it tightly with a thin layer of aluminum foil. This cuts off radiation from the light bulb (the lamp light is reflected from the shiny foil), but since the foil is a good heat conductor, conduction and convection from the surface of the foil should be pretty much unchanged with or without the foil. This is an experiment that you should ONLY do if you have a clue about handling electical stuff. 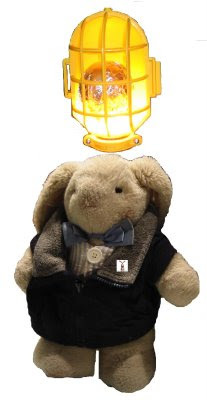 There IS a significant shock hazard if you let the foil touch the metal base of the lamp, but Eli IS an electric bunny, and stuffers are insulators, so he took a 75 W incandescent lamp and put it into a drop light (there is some danger of the lamp shattering if the temperature gets too high) and turned it on. Eli found that the top of the lamp was hottest, and he measured the temperature with a thermocouple (it's handy to have a lab): 160 +/- 5 C. Next he turned the lamp off, let it cool and wrapped it with a single layer of thin (cheap) aluminum foil and turned the lamp on again: 300 +/- 5 C.
Eli rests his case, besides which he just heard some guy on the Weather Channel talking about how clouds and water vapor act like thermal blankets when the sun goes down, and how it cools off a lot faster when the sky is clear and it is dry. DO NOT DO THIS UNLESS "YOU" KNOW HOW TO WORK WITH LIVE ELECTRICAL EQUIPMENT. Eli Rabett, Rabett Labs and everyone else assumes no responsibility for anyone who tries to duplicate this. There is a significant chance you could be nominated for a Darwin Award if you are careless. Irrelevant conclusions and non sequiturs: "Red Herring"
Other errors of logic: "Nonsense"
Errors of interpretation or misunderstanding: "Confused"
Arguments that only work for specially selected data: "Cherry Picking"
Other arguments that have no scientific validity: "Invalid"
Statements that contradict or conflict with other statements in the text: "Inconsistent"
Also please note that simply itemizing errors in an article doesn't prove one way or another whether the central premise of the article is wrong or not (the "fallacy fallacy"). Monckton's central question is on climate sensitivity. The magnitude of that sensitivity is a central question of climate science as a whole, and in particular centers on the sign and magnitudes of various feedbacks to temperature increase in Earth's climate system. The most recent IPCC report (AR4, Working Group 1, 2007) presented a robust collection of evidence from physical modeling, paleoclimate, and observed recent response of the climate system for their conclusions of a temperature response to CO2 doubling of between 2 and 4.5 K, with a best estimate around 3 K. The substantial collection of errors in Monckton's article renders his arguments against this IPCC conclusion quite unconvincing. An outbreak of the "the greenhouse effect is not like a blanket" has recently been spotted in several locations. This consists of saying that blankets don't work by cutting off radiative transfer, but only convection. There is a neat little item that the bunnies huddle under when caught out in the cold, called a survival blanket. First developed by NASA, it is in the emergency kit of an half-wit or above who ventures out into the wild. Basically a thin, light silvered film that you can wrap about yourself and your loved one (us bunnies are very warm), which both cuts off convection and reflects back thermal radiation from your body and keeps you toasty and alive. Invite a denialist of your acquaintance to huddle under one of these. Interesting things are happening out there for which Eli cheerfully accepts his share of the blame. First, Werner Aeschbach-Hertig provides a reality check in his new blog. Prof. Aeschbach-Hertig is the fellow who undressed George Chilingar. You can read more about this at the link. He brings an interesting set of expertise to the table, being a specialist in paleoclimate and hydology. His university web site is also worth plundering. Among other goodies, is a large set of Powerpoint presentations on various climate topics at all levels. While Eli and Ethon had observed the show the PNT analysis is a must read. Previously Eli pointed to Naomi Oreskes showing how Yohe provided the head fake that Wm. Nierenberg used to stop any rational action against the looming threat of climate change in From Chicken Little to Dr. Pangloss: William Nierenberg, Global Warming and the Social Deconstruction of Scientific Knowledge by Oreskes, Conway and Matthew Shindell. Sylvia promises to blog about this more in the future. It will be worth reading. Eli has added something to the blogroll, a short list of climate blogs written in other languages. The old joke is that every conference today has two official languages, English and bad English, and indeed English is today the world's lingua franca which pisses the French off no end. However, all of us who do speak English have a dream, a dream of giving a lecture in bad something or other, bad enough that you can hear the teeth in the back row grind, watch the undergrads leave, but be clear enough that the others stay and maybe even ask us what the hell we ment. Eli has done this. Revenge is VERY sweet. So if you have some other favorite climate blogs written in a language other than English, well that is what comments are for. Of course I looked up Herr Beck when I received the invitation to the colloquim from one of my colleagues and for sure I inquired of him what the hell was going on. In spite of everything it was his express desire to invite Herr Beck and I could not stop him even though we were all left shaking our heads. The seminar and the discussion that followed made it very quickly clear that our fears about what he would say were sadly well taken. There was no physics in his "arguments". As in many similar cases it was not possible to move Herr Beck from his position, come what may. Personally, I think that when we don't take down such a "seminar" then nothing further helps. Moreover, "we" can learn something from such a "seminar" because it provides rich ammunition that can be used to set the false right again. It is my experience that people like Herr Beck or Herr Thüne unmask themselves. Whoever listens to them quickly notices after the first sentence that the talk is not about science but their own "personal problems" or "purchased opinions? Anyone who looks EXACTLY at Beck's measurements finds the Keeling Curve and its extension into the past (through the ice cores)is CONFIRMED exactly. Every time surface measurements were done properly since the middle of the 19th century under conditions where one would expect to observe the background atmospheric mixture (then by chance, today (Keeling) with intent) the values all matched the expected Keeling or ice core levels. The surface is at ~290 K. It radiates ~400 W/m2. In addition there are losses from latent heats (maybe another 100 on average). The average solar power absorbed by the surface is ~190 W/m2, call it 200 W/m2. That means, neglecting latent heats, if there is no radiation from the atmosphere absorbed by the earth, the surface will cool until the net outflow of radiation in the IR matches the radiation absorbed from (corrected-ER) the sun. Do the math E = 200 W/m2 = σ T4, so without back radiation from the atmosphere, the temperature of the surface will reach an equilibrium at 244 K. If you include convection, which is strictly a loss from the surface, the temperature would go even lower. OTOH, if 200 of the 400 W/m2 radiated into the atmosphere in the IR are returned to the earth from the colder atmosphere, there is a balance between energy absorbed at the surface, Sun + Atm Return =200 +200 and surface radiation = 400 W/m2. Read the comments. . .